Sediments accumulate in a wide variety of environments, both on the continents and in the oceans. Some of the more important of these environments are illustrated in Figure 6.17. Table 6.3 provides a summary of the processes and sediment types that pertain to the various depositional environments illustrated in Figure 6.17. We’ll look more closely at the types of sediments that accumulate in these environments in the last section of this chapter. 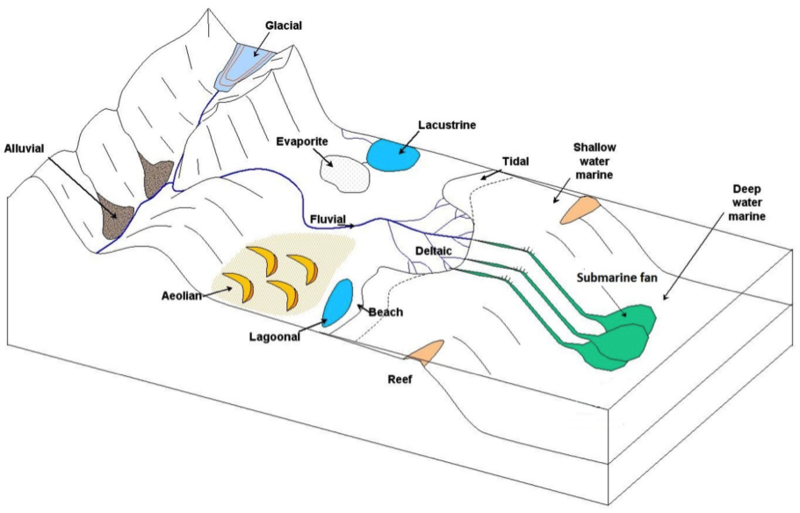 The characteristics of these various environments, and the processes that take place within them, are also discussed in later chapters on glaciation, mass wasting, streams, coasts, and the sea floor. * OM (organic matter) only accumulates in swampy parts of these environments. Most of the sediments that you might see around you, including talus on steep slopes, sand bars in streams, or gravel in road cuts, will never become sedimentary rocks because they have only been deposited relatively recently — perhaps a few centuries or millennia ago — and will be re-eroded before they are buried deep enough beneath other sediments to be lithified. In order for sediments to be preserved long enough to be turned into rock, a process that takes millions or tens of millions of years, they need to have been deposited in a basin that will last that long. Most such basins are formed by plate tectonic processes, and some of the more important examples are shown in Figure 6.18. Trench basins form where a subducting oceanic plate dips beneath the overriding continental or oceanic crust. They can be several kilometres deep, and in many cases, host thick sequences of sediments from eroding coastal mountains. There is a well-developed trench basin off the west coast of Vancouver Island. A forearc basin lies between the subduction zone and the volcanic arc, and may be formed in part by friction between the subducting plate and the overriding plate, which pulls part of the overriding plate down. The Strait of Georgia is a forearc basin. A foreland basin is caused by the mass of the volcanic range depressing the crust on either side. Foreland basins are not only related to volcanic ranges, but can form adjacent to fold belt mountains like the Canadian Rockies. A rift basin forms where continental crust is being pulled apart, and the crust on both sides the rift subsides. As rifting continues this eventually becomes a narrow sea, and then an ocean basin. The East African rift basin represents an early stage in this process. 6.3 Depositional Environments and Sedimentary Basins by Steven Earle is licensed under a Creative Commons Attribution 4.0 International License, except where otherwise noted.